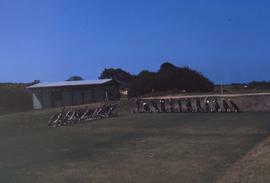 Colour Kodachrome 35mm slide depicts golf bags organized neatly on the green at the Caesarea Golf & Country Club. Photograph depicts a golf course, most likely Capilano Golf and Country Club.Fairway with three sand traps in foreground of image; heavily treed area and mountains in background. Colour Kodachrome 35mm slide depicts a golf course with a sand trap in the foreground and a water trap in the background. The Desert Horizons Country Club is in California so this slide may have been mislabeled. Photograph depicts golfers at Jericho Golf and Country Club.Seven golfers ascending fairway hill, towards sand trap; clubhouse in middle of image; English Bay, Stanley Park shoreline, and North Shore mountains in background. 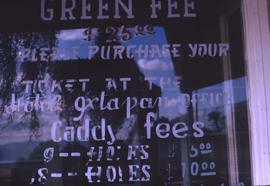 Colour Kodachrome 35mm slide depicts golf push carts in the foreground and five golfers on a putting range in the background. Photograph depicts an audience watching a golfer putt at Shaughnessy Golf Club.Crowd of people gathered in middle of image behind man preparing to putt on green; trees, clouds and mountains in background.